We work on all different kinds of treadmills in our day to day operations. This is a time lapse video of the a rear axle replacement on a Woodway Desmo treadmill we completed last week. 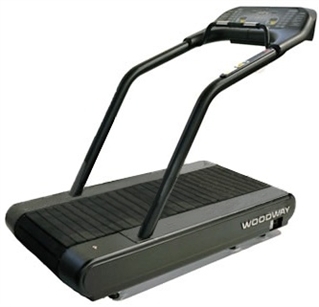 If you are not familiar with Woodway treadmills, you should check them out. In the treadmill world, they are considered one of the best and are the treadmill of choice for all the professional sports teams we work will including the Cleveland Browns and Cleveland Indians. They use a unique kind of treadmill belt system the looks like a tank tread and gives the runner a soft cushioned running surface that eases pressure on the joints. Most people find it hard to go back to a conventional treadmill once they have had a chance to try a Woodway. They are pretty heavy so if you are looking to have one installed in your commercial gym or home make sure you have plenty of help to move it! Let us know if you have any questions about Woodway treadmills or need a repair. We have been an authorized service provider of Woodway for many years and can answer any questions you may have. In the mean time enjoy the video. The actual repair takes a little over an hour, but we scrunched it down to 20 seconds. So don’t blink! © Copyright 2019 Zimmer Fitness Repair. All rights reserved.